Angela Constantine is a girl born broken. The daughter of a meth addict, Angela is convinced she was born a monster . Haunted by an abusive childhood, she was forced to become a woman far too soon . And in the process, she became more. Angela Constantine has a secret. Living in a secluded mountain cabin and juggling several jobs, Angela leads a double life right under everyone's noses. Because her family's bloodline carries the ability to recognize killers , she adopts a solitary existence in service of her own violent mission in life. When she unexpectedly finds herself stalked, Angela is the only one who knows the truth of what they are about to do . She's an unlikely hero. She's also our only hope. Angela Constantine is . . . 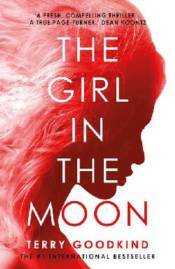 The Girl in the Moon.